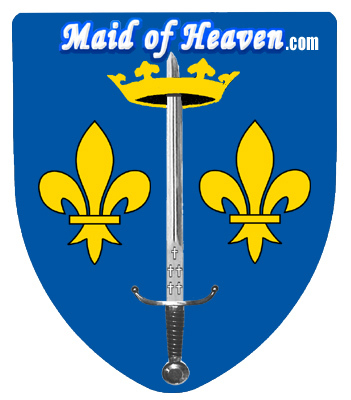 Sometime during the winter of 1429-1430 Charles VII elevated Joan of Arc and her entire family to nobility. In the official document that Charles executed he referred to Joan as “dear and beloved” and explained that her whole family was ennobled “that the memory of the divine glory and of so many favors may endure and increase forever.” Joan was given the family name of du Lys with armorial bearings(coat-of-arms) as Charles had created for her previously in June of 1429 of a sword supporting a crown with a fleur-de-lis on each side. While Joan later stated at her trial that she had never personally used the armorial bearings and that the King had given them to her brothers the elevation to nobility was a huge honor for Joan and her family and one that she well deserved. Vive la Joan of Arc!